Crypto exchanges are busy extending their reach to cater for Initial Exchange Offerings (IEOs). Binance was first to the party and Huobi is now following with its project lab Huobi Prime, a coin launch platform, which opens for business on March 26 to rival Binance’s Launchpad. Huobi Token (HT) is the 51st largest digital currency in the market. It has a market capitalization of $124.83 million and each HT can be bought for $2.5. Since March 1st, HT has increased more than 250%. Huobi Prime, the exclusive initial exchange offering (IEO) platform of the veteran cryptocurrency exchange Huobi Global, has completed its first “selective token sale” of TOP Network. The whole fundraising event went through three price limit rounds, each one of which concluded in less than a few seconds. Despite selling out all the predetermined TOP tokens and reaching the project’s hard cap in seconds, the community has expressed major concerns regarding the technical incapability of Huobi Prime to handle the huge demand – just as it was with Binance Launchpad. The IEO platform of Huobi Global – Huobi Prime, has completed the first selective token sale event in a matter of seconds. As Cryptopotato reported, the process went through three different “price limit” rounds, each one of which lasted for 20 minutes. However, the actual purchase of the listed tokens took no more than a few seconds throughout every round. The event managed to sell a grand total of 1,500,000,000 TOP tokens, which is exactly 7.5 percent of the total token supply of the project. The first round had the highest tradable price capped at $0.00177, the second round at $0.00213, and the last round at $0.00255. 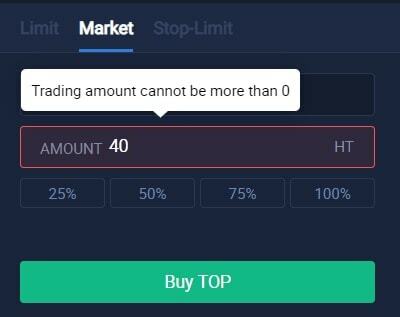 As it was initially disclosed, TOP was almost immediately listed for conventional trading on Huobi Global against Huobi Token (HT). As seen on the real-time Huobi exchange chart, immediately after being listed, the price catapulted. It peaked at around $0,0065, which is roughly around 250% increase from the price of the token during the first sale round. At the time of this writing, TOP is trading at $0.0046, marking an increase of about 150%. Much like it was the case with Binance Launchpad, Huobi Prime went through challenging technical issues, ultimately failing to cope with the high demand. As we mentioned above, all the rounds were finished in just a few seconds, leaving a major portion of those who wanted to participate without any chance at all. While Huobi said that the first round was completed in 7 seconds, the overwhelming majority of users claimed that it took even a lot less. People reported various problems with their user experience while trying to participate in the IEO. Some said that their balance during the session incorrectly showed absolutely no availability of HT tokens (shown below), even though they clearly had deposited. Others complained that even though they placed their buying orders within seconds, the platform failed to process them, saying that the round is over. It’s undeniable that IEOs are met with huge demand, which is beneficial for the projects aiming to raise money. However, it’s also important to cope with this demand in order to enable those who want to participate to actually obtain the tokens subject of the sale. At the time of this writing, Huobi hasn’t addressed any of the reported issues. In the meantime, it’s worth noting that KuCoin’s IEO platform – Spotlight, is scheduled for MultiVAC launch on April 3rd. More upcoming IEOs can be found on our IEO List.